“The St. Paul Union Depot, in the midst of a $243 million restoration, has lost one of its first major tenants before it officially reopens its doors. Ramsey County officials had anticipated that the Greyhound bus line would relocate this year from near Rice Street and University Avenue to the refurbished transit hub overlooking Kellogg Boulevard. Instead, the bus company has told the county it will leave St. Paul entirely. “The brain appears to be wired in a rectangular 3D grid structure, suggests a new brain imaging study funded by the National Institutes of Health. “The Evacuated Tube Transport (ETT) system (U.S. Patent 5950543, assigned to ET3.com, Inc.) would take passengers from New York to Beijing in just two hours. Advocates of Evacuated Tube Transport (ETT) claim it is silent, cheaper than planes, trains, or cars and faster than jets. Nearly $1 billion per year in increased economic activity would result from a proposed Rochester-to-Twin Cities high-speed Zip Rail line, concludes an analysis produced for Rochester Area Economic Development Inc.
“We think this study makes it clear — the benefits are significant and net-positive,” said RAEDI Executive Director Gary Smith. The purpose of the study, Smith cautioned, is not to establish the feasibility of the route and its estimated $1 billion construction cost. The study was merely a statistical analysis of the likely economic benefits, calculated using certain established formulas and assumptions. The study assumed a nonstop route between downtown Rochester and Minneapolis-St. Paul International Airport. Such a route would attract an estimated 1 million riders per year, the study assumed. Trains traveling at speeds between 150 and 220 mph would shave 30 minutes off the travel time by car and make the travel time itself potentially productive for the travel freed from the task of driving. Benefits accrue from that increased productivity, as well as from tying together the unique biomedical and research economies of the two metro areas, said Frank Loetterle, transportation planner with R.L. Banks. “There’s a synergy that occurs here … that doesn’t occur other places,” he said. • Statewide, economic activity would increase by $987 million per year, and by $84 million in Olmsted County alone. • Increased employment, over 25 years, would total nearly 7,900 jobs, including 3,250 involved in the planning, design and construction. More than $7.6 billion in individual income is attributed to the job increase — again, over the 25-year time span analyzed. A line that carries 3000 people each way per day maximum (10 one-way trips of 300 passengers each) will generate 7888 jobs. Only 610 of those jobs are in Olmsted County. So most people who benefit are elsewhere in the state because of the accessibility benefits given to the airport and the Mayo clinic … ? We have evidence of all this job growth from what? There is no US experience on which to validate job increases associated with HSR infrastructure. Driving is assumed to be non-productive time. They have not heard of autonomous vehicles, which I hope will be quite available in well less than 30 years. Thus time savings is all of auto travel time, not just the difference in travel times. Passengers of autos seem to be counted as non-productive as well. The sick Mayo patients on-route will be productive. Nice to hear. Maybe they will want to rest up? I will not comment much on the safety benefits, which are relatively small. It is a needlessly dangerous section of highway which could (and undoubtedly will) be fixed for less than the cost of this ZipLine. Nevertheless, cars will get safer over time for a variety of reasons, even if you don’t assume automation. Petroleum use is assumed fixed, 2.5 million gallons. I.e. in 30 years, autos will still get 20.3 mpg and buses 3.7 mpg. Tax revenue is counted as a benefit. The annual ridership is assumed to be about 1 million, which exceeds the best-case forecast of the Minnesota Comprehensive Statewide Freight and Passenger Rail Plan of 750,000. In 2008, total trips between Twin Cities and Rochester where just under 2 million, so they expect to capture half of all of the trips. Unless those trips are destined for the rail stations on either end, they will need to transfer. Most people do not live at the airport or in walking distance of downtown Rochester. Aside from Mayo patients flying in, there is not much market there. I would be surprised if that were anywhere near 1 million patients per year. At present there is no congestion between Rochester and MSP on highways. A distance of 77 miles is covered in 75 minutes. I am sure I am missing obvious critiques, since I am doing this on the fly. Feel free to chime in. (1) $1 billion in added noise benefits. Since noise reduces property values, renters and new owners will be able to buy land for cheap. (2) $10 billion in opportunity costs avoided. Since the HSR line will result in other bad construction projects avoided, and since we can’t afford everything, there is clearly a benefit here. (3) $5 billion in added profits for the operators of the line. The line will cost billions to operate over time, so that must be a benefit to those paid to operate it. (4) $3 billion in construction benefits. We are paying people to build the line, they benefit. Therefore all construction costs are benefits. (5) $9 billion in development. There will be new development in Rochester and the Twin Cities. All of that can be attributed to the HSR. (6) $.5 billion. There will be development taking place in Rochester that would otherwise take place in Mankato. That is another benefit. (7) $35 billion. The Mayo Clinic won’t move to Phoenix. Lysander Spooner is one of those great Americans about whom you should read the wikipedia article. E.g. he was an ardent abolitionist who supported the right of the South to secede. “Look, up in the sky! It’s a bird! It’s a plane! When including our vibrancy measures, we find that downtowns with more hotels and more restaurants per capita are also associated with less driving. Our findings with respect to the vibrancy-public transit connection show that places that have an educated downtown population, a low murder growth rate, and a high number of live-music performers are associated with higher public transit use. 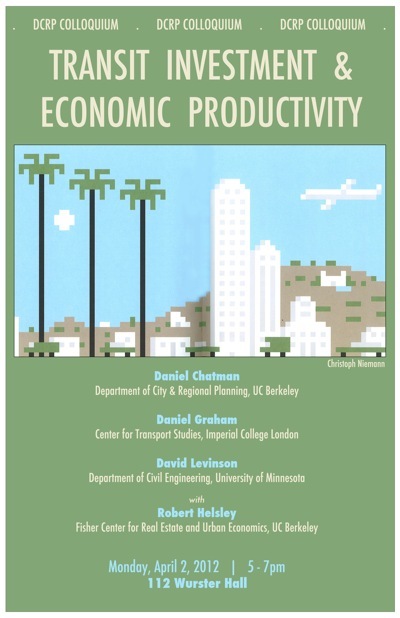 I will be presenting at a DCRP Colloquium Berkeley with Dan Chatman, Dan Graham and Robert Helsley on Monday April 2, 2012 on the topic of Transit Investment and Economic Productivity. It is at 112 Wurster Hall Monday from 5 – 7 pm. Yesterday, I pointed out that Rep. Paul Ryan’s GOP budget proposal would require the federal government to spend less and less on transportation over time. Reihan Salam asks whether this is really such a bad thing. Can’t state governments just pick up the slack? Upgrading our transportation networks may well cost between $200 and $262 billion over the next decade, or perhaps even more. It’s not obvious, however, that all of this money has to come from federal coffers. Other approaches might involve relying more heavily on state governments and private investors, as Edward Glaeser has suggested, and perhaps focusing federal efforts on a “fix it first” agenda. This doesn’t mean that Ryan’s approach is the only answer. But it’s worth decoupling federal spending from transportation spending — the categories do not and should not overlap, and it seems entirely reasonable to argue that the non-federal share of the transportation spending pie should grow over time. “Every time a new addition is made to the Tube map, it gets a little more crowded. The clean lines of Harry Beck’s original get a little more confusing. Where will we be 100 years from now, when additional lines, stations, cable cars, hover rails and levipads are added to the diagram? Annie Mole at Going Underground’s Blog has some 3D posters and other diagrams. “The Dutch “bird man” who posted a video showing a successful “test flight” of a wing suit contraption has admitted that the amazing feat was a hoax all along. Viewers became sceptical after it emerged that no scientists actually knew “Jarno Smeets,” who claimed to have created the technology.